Do You Do Doubles? Don’t! A frequent complaint in jails comes from inmates who request extra food for various reasons–they are underweight, they are just way hungry, whatever. Meth addicts, in particular, seem to arrive at the jail ravenously hungry, I guess because they have been tweaking instead of eating. 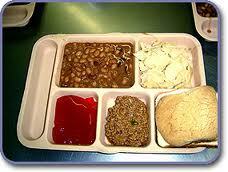 At many facilities, inmates ask for “Doubles,” which means double food trays with every meal. “Doubles” are very popular with inmates as you might imagine. In general, a request for extra food falls into the broad “Comfort Items” category that also includes requests for own shoes (discussed here), double mattresses (discussed here), extra blankets, warmer clothes, bottom bunk, my own bra (nothing at the jail fits) etc, etc. These requests are unique to correctional medicine. Nobody goes to a medical clinic outside of jail with the chief complaint of “I need a softer mattress” or “I need double portions at each meal and my wife won’t serve it to me.” (At least, in 25 years of emergency room practice I never saw any such complaints). The request for extra food is a little different from, say, a request for a double mattress because some patients really do have a legitimate medical reason for extra Calories. Before we discuss such patients, however, there are several items that we should keep in mind. 1. Most correctional institutions offer between 2,500 and 3,000 Calories per day to each inmate. This is far more Calories than the typical patient needs. A “quick-n’-easy” calculation for the number of Calories a particular person needs to eat to maintain their body weight is this: 12 times body weight (in pounds). For the standard 175 pound male (like me), that works out to 12 x 175 = 2,100 Calories per day. If I were to eat a jail diet of 2,500-3,000 Calories a day, I would gain weight. Because of this excess of dietary Calories, significant weight gain while in jail is a significant problem. (As an aside, I remember seeing one inmate who had just been released from jail waiting for his ride home wearing boxer shorts and carrying the pants that he had been booked in 8 months previously–he could no longer fit into them. His boxer shorts had little hearts on them, no lie. Another inmate gained so much weight that he could no longer wear his dentures). The problem is even worse for women, who are generally smaller and need less food but who are served just as many calories as the men. Here is an interesting article sent to me by my friend Katie Clark that discusses this very problem: Study Examines Diet, Exercise,Obesity in Prisons Worldwide. So even if underweight inmates are not given access to extra calories, the standard correctional diet is usually enough for them to gain weight. 2. Most inmates already have access to extra Calories via commissary food. Of course many inmates do not have access to commissary, like those who are indigent and those who have administrative sanctions (like lock-down). Also, there is at least a one week wait in most jails from the time of booking until an inmate can conceivably receive extra food items from commissary. The meth addicts arrive at the jail ravenously hungry and have a hard time waiting a week for extra food. Also, commissary food is mostly junk food with little nutritional value. However, if you routinely check the commissary purchases of those who request “Doubles,” you will invariably run across someone who has been purchasing lots of commissary food and is requesting “Doubles” for non-medical reasons, discussed below. 3. Inmates often request extra food for many non-medical reasons. These include the ability to eat more of their favorite foods rather than foods they do not like, the ability to give extra food away as favors and as a sign of increased status among other inmates. Like it or not, extra food, whether it is “Doubles” or diabetic snacks, is a highly desirable commodity in the inmate economy. Those to whom we grant extra food gain privileged status and those who we refuse, resent it. This is a very important principle, the Principle of Fairness. Ignore this one at your peril! Having said all of this, the big question is “Which patients would medically benefit from extra food?” The answer is: those patients who are malnourished. One objective sign of malnourishment are those patients who are demonstrably underweight on a Body Mass Index, like the one here. A BMI of less than 18.5 is defined as underweight. A BMI of >18.5 is defined as being normal weight. Using a BMI of <18.5 as a cutoff makes it easy to identify patients who may benefit from extra calories. This can quickly and easily be done by the nursing staff. Patients who request “Doubles” have their height and weight measured by the nurses and plotted on a BMI chart. Those with a BMI of >18.5 are told that they are normal weight and that they do not qualify for extra Calories. Those with a BMI of <18.5 have extra Calories ordered and are scheduled for a recheck of their weight in one month. If their weight then is >18.5, the extra Calorie order is rescinded. Patients with a BMI of <17 are deemed seriously underweight and are scheduled into medical clinic for a complete physical to ascertain why they are so skinny. The nurses, of course, can refer anyone else to the medical clinic who they are worried about. At the Ada County Jail in Boise, Idaho, the nurses have placed a BMI chart next to the scale in the medical clinic waiting room along with an explanation of the 18.5 BMI cutoff. It is a common site to see inmates checking their BMI on the chart and then deciding not to submit a medical request. “Doubles” doubles the Calories you are serving the patient from 2,500-3,000 a day to 5,000-6,000 a day. That is a big jump! Most people cannot eat that many Calories in one day, even if they try. Most patients will do fine on, say, 1,000 extra Calories a day. A patient given two diet trays is not going to do this: Eat everything off of the first tray and only then tuck into the second tray. Instead, the patient is going to eat the things he likes best off both trays (meat and potatoes, say) and not eat those things that he does not like (like vegetables). In the interest of a healthy diet, we would prefer that he eat his vegetables, but that is not going to happen. Since the patient likely cannot eat everything on his two trays anyway, why not give extra food away to other inmates as trade or for favors? The inmate gets power and status from the extra tray and lots of other inmates will be jealous of this and want “Doubles” too. Instead of double trays, a much better way to provide extra calories is by giving qualifying inmates one or two cans of supplemental nutritional drinks like Ensure or Boost each day, say one at breakfast and one with dinner. I can tell you from experience that these have very little value in the inmate economy. (You can prove this by putting them on the commissary and seeing how many you sell! They are not popular). In fact, once you switch from “Doubles” to Boost, your medical requests for extra calories will drop by 80%. No exaggeration. There are other patients who will benefit by getting Ensure or Boost supplementation even though they might have normal BMIs. One example is alcoholics. Especially when they are going through withdrawal, they often have trouble eating. Often, it is easier to get liquid Calories into them (Boost) rather than solid calories. It is often the same story with chronically ill patients, say those receiving cancer chemotherapy. An easy and objective way to define who qualifies for extra Calories is to use BMI. Inmates with a BMI of <18.5 qualify for extra Calories. Double trays are not the best way to provide extra Calories to underweight inmates for several reasons. Boost, Ensure, or some other well-balanced nutritional supplement is a much better way to provide extra Calories to qualifying inmates. How do you handle requests for extra nutrition at your facility? Please comment! This entry was posted in Comfort items, Food, Inmate issues, Jail culture, Medical Practice and tagged BMI, Body mass index, correctional medicine, Double Trays, jail medicine, jails, Prison, prisons, Underweight, Weight gain on May 2, 2012 by Jeffrey Keller MD. I think it is also interesting to note, that this same 2500-3000 calorie diet is a what the women are eating too. If they stay for any lenght of time, they almost always gain weight. Especially when combined with commissary. I disagree with the non-value fo boost and ensure. These are very desirable for the weight lifters who are trying to “bulk up”, to those who are trying to brew “hooch” and just as an extra container to be used in whatever manner conceivable. The few inmates we order boost for must consume it in the dining hall – they cannot take it back to their cells. Thanks for the comment, Vincent. Boost and Ensure don’t seem to have much value in the inmate economy in my jails, but what you say makes sense. The solution makes sense, too. The inmate drinks the Boost first, returns the container and then is given his food tray. No sharing, no container. I also agree that very few inmates even qualify for supplemental Calories by having a BMI of >18.5. This was a very enlightening post to read, as I am currently conducting research advocating reform in regards to the standards of prison food, including nutritional quality, and food safety. It us absurd to me that there would not be differences in the amount of calories allocated for men and women. With the rate of obesity nation-wide, as well as the high rate I would assume exists in prisons, coupled with the fact that prisons try to cut their food costs as much as they can, you would think they would have adjusted caloric intake standards for women. I have been unable to find any statistics on the rate of obesity in prisons, however, many articles and reports exists as to an increase in chronic diseases such as type 2 diabetes and hypertension amongst prisoners, which are likely linked to prison diet. The average cost of feeding a prisoner one meal ranges between .20 cents and one dollar. As you point out, doubling portions contributes to obesity, and I wonder how much money could be saved each year in medical expenses to pay for promoting “real food” in prisons instead of adding supplements and applying a “one size fits all” methodology to prison diets. Thanks for your comment, Ashley. I am interested in your research. I suspect that it will show that a healthy diet, meaning some fresh fruit and vegetables instead of a steady parade of “white carbs,” will actually turn out to be less expensive in the long run, especially if we make some of the changes we have discussed, like decreased potions for women and no diabetic nighttime snacks!. Does anybody know what percentage of the daily calories is “liquid crack”? (The very thick, very sweet drink served at every single meal). I tend to believe it is a significant chunk. I personally have never heard of “liquid crack.” Do you work at a prison? Having a hard time posting my reply. 3rd try. In the WA county jail in hillsboro, oregon they serve a thick, syrupy, clear liquid at each meal. The female inmates who decline this drink tend to drop weight dramatically during their stay. And it is common knowledge there that the majority of the daily calories are derived from this drink. If it is weight loss you are addressing, one would likely lose any weight if they were to be provided just plain MILK or plain yogurt before going to bed. The “clear syrup” inmates were given was probably HFCS….cheap cheap cheap. Ensure and Boost is full of HFCS . Very interesting….no food or supplements, just “sugary” syrup water for inmates. What happened to “first do no harm”? If inmates were eating up to 80% fresh raw vegetables and fruits, and milk, (with vitamin D) they would not have food cravings, and they would not have problems with obesity or a myriad of other health and emotional problems. And a multivitamin is far cheaper than a can of Ensure. Really all inmates should be given the option to at least BUY a multivitamin with canteen money.